What is the process in order to reserve a property? After we have corresponded via email, please call me in order to start the reservation process. Once you are ready to move forward with a reservation I will send you a rental agreement via email. Tenant is to sign and return rental agreement, preferable via email but not necessary. The Deposit of 20% is due with the signing of the rental agreement. The villa will be on hold for 5 business days in order to complete the reservation process. A confirmation will be sent via email once both the deposit and the signed rental agreement are received. Balance must be received by the due date (2 months prior to rental date) which will finalize the reservation. Confirmation email will be e mailed confirming the completion of reservation. At what time is Check In time/ Check Out Time? Check in is at 4:00 PM and Check out is at 12:00 noon. Can I have early check in or late check out? Early check in and Late check out are available at no additional cost if the villa is not rented the following day , upon availability. Please provide arrival time in order to try to accommodate early or late check in/out. What happens in the event of a hurricane or natural disaster? We will reschedule the rental at a time when the house is available. Do I need to give a deposit for damages to the property during your stay? For Villa Tuscany, The Mansion, and Villa Capri it is mandatory that you purchase at least $5,000 in damage insurance (can be purchased for $99 at www.propertydamageprotection.com). You and your guests are 100% liable for all costs incurred as a result of damages. Are there other charges other than the rent? Where do I purchase the property damage insurance? Home away website or FlipKey website. You can send a separate check for the damage protection and I can purchase it for you. A copy will be emailed to you at the time of purchasing. Is the cleaning fee during my stay? No, the cleaning fee is for the house, laundry and surroundings to be cleaned after your departure, NOT during the stay. How much does it cost to rent the golf carts? Golf carts are $50 per day for CLR guests, includes unlimited gas and insurance. For Non CLR guest the Golf cart rentals is $60 per day. CLR guests have priority reserving golf carts. Must give advance notice in order to secure a golf carts. They are in high demand in the resort. Who can I contact in case there is problem at the house? Are golf carts necessary during our stay? Yes It is a large resort, most common way of transportation within the resort is via golf carts. How far is the beach from the houses? About a 15-minute walk or a 5-minute trip in golf cart. Can I use the Resort Amenities? The Hotel is open for all guests. Everyone has access to the restaurants, bars, and casino. Caribbean Luxury Rental guests have access to the villa community pool (on the beach) and beach area that has lounge chairs for no additional cost. Access to the hotel pool and beach area is restricted. For more information call us; 305-790-6619. There are fees associated with using the tennis courts and golf courses. Can I use the Hotel Gym? Every bathroom comes equipped with two rolls of toilet paper, soap, 2 oz. shampoo bottle, and 2 oz. conditioner bottle. Additional toilet paper, shampoos, and soaps are the responsibility of the guest. The resort is 19 miles from SJU, the San Juan International Airport (Luis Muñoz Marin Airport). What activities do you recommend during our stay in PR? Please see the activities sheet. What activities do past guest enjoyed most? 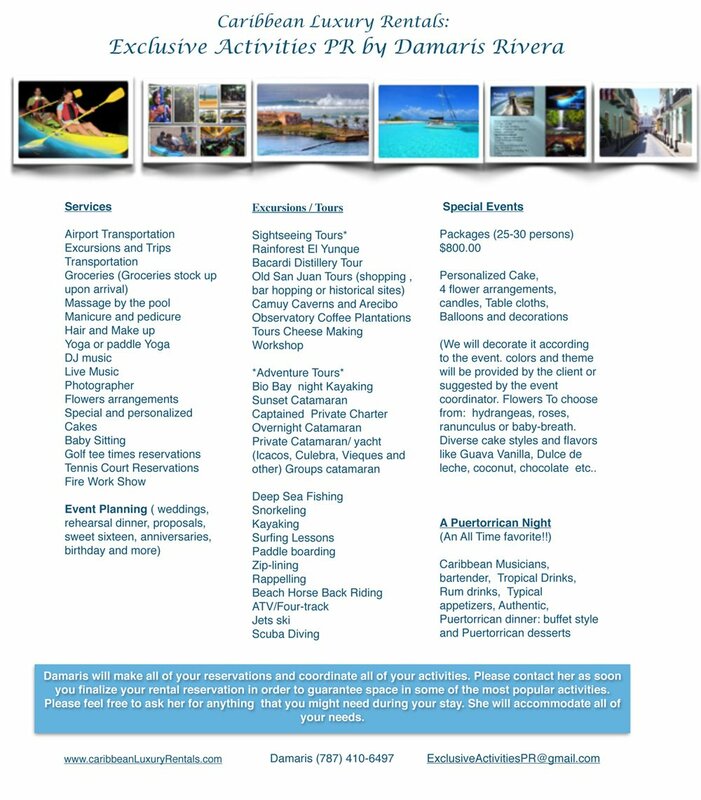 We highly recommended a private catamaran charter, bio luminescent night kayaking, Flamingo Beach day trips, zip lining, and deep-sea fishing. For the more adventurous, the rain forest trails and waterfalls are incredible! How do I know which trail to take in the rain forest? There is an information center at the entrance of the rain forest, you can view the different trails on line, but most of our guests end up hiring one of our experienced guides. How far is the rain forest?